As charity communications professionals, we know the power of digital in the sector. We also know that video has immense potential to boost donations, encourage sign ups, raise the profile of our cause and engage with supporters. Still, the ever-evolving digital marketplace brings challenge; the constant momentum of thinking ahead to the next thing that’s going to grab the viewer for those crucial seconds, make them stop, listen, click and take action. There are some incredible, innovative examples of charities across the globe using VR to do just this. And with research showing that ownership levels of VR headsets outstrip those seen for wearables and tablets at the same stage of their life cycle, perhaps this new exciting technology is not as far away for charities as we assume. As a hospice communications team we face another challenge: most people don’t really know what hospices actually do. In fact, a recent survey by ComRes shows one fifth of people surveyed think hospice care is only for people in their last days of life. No wonder patients and families might be apprehensive to hear from us, or engage with the brilliant services provided for people at all stages of their diagnosis by hospices around the country. In order to tackle the taboo and myth-bust misconceptions of hospices being dark, dreary places where people come to die, we needed to show people what life is like behind our doors. Viewers hear from the people they’ll meet when they step through our doors, from our receptionist to our café team to a nurse in our inpatient unit. There’s the added benefit of demonstrating the value of our work to supporters too; the viewer can sit in on patients enjoying a physio class, and painting in the tranquil Mulberry Room. As exciting and ground-breaking as the potential of VR is, the challenge remains that only 6% of the British population currently owns VR headwear. So, wherever we can, we bring our VR tour to the community at health fairs, in our shops, at events and to the 1,700 patients and families we visit in their own homes every year. To reach as many people in as many places possible, we decided our tour should also be accessed as a 360 video that can be interacted with from a flat screen desktop, tablet or smartphone. There are also cost effective methods charities can seek for using VR as a more widespread tool. For example, Google Cardboard – a simple viewing technique that allows users to build or buy VR experience through the use of cardboard goggles. My patient’s mother was elderly and unable to see the hospice facilities for herself. I showed her the 360 video tour from my iPad and it helped her to get a feel of the hospice and calm feelings of anxiety about her daughter choosing to come here for her last days of life. The VR tour is definitely having a positive impact in the community where we want to drive engagement and reduce feelings of anxiety that come with referral; but we’re also exploring the full potential VR has to transform the way we work in the immediate future. So far, this has proven to be of most use therapeutically on our inpatient ward. In fact, our entire journey with VR began as a “bucket list” idea for patients at the end of their life. VR at Trinity has seen our patients swim with dolphins, witness the northern lights, go on safari – and in one very special case – take an entire family to Disney Land. 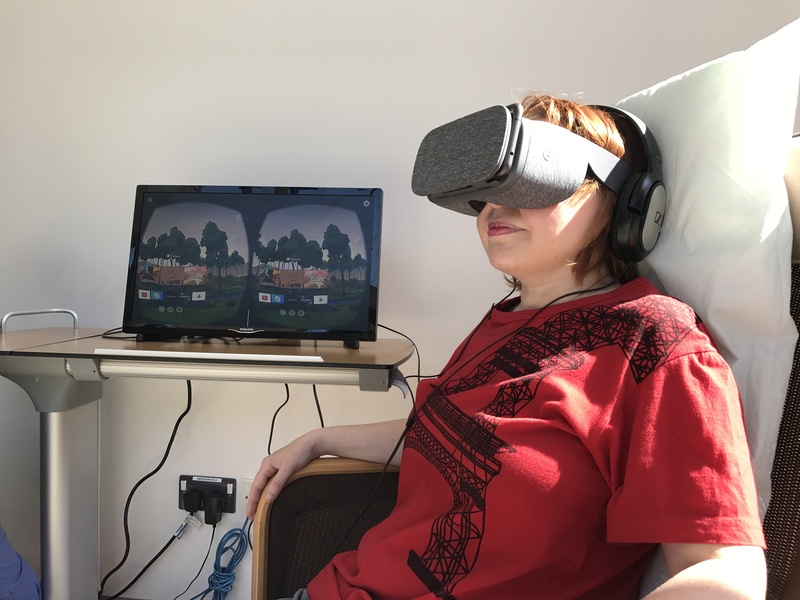 We’ve started work on a research project looking at whether VR can be of benefit to palliative care patients and the impact this type of therapy may have on their physical and psychological symptoms. We are now also using Reality Enhanced Experiential Learning Scenarios (REELS) as a training tool for our nurses that provides ‘hands on’ scenarios and experience for staff. So far it’s delivering exceptional engagement and information retention. So far, our VR journey has taught us of the immense opportunities this technology has in terms of tackling taboo and providing innovative treatment and training for hospices. However it’s important to appreciate that VR is still in the early stages of development, meaning its use might be most effective for charities, at the moment, when providing a solution to isolated problems and needs such as these. The experience also highlights the value of keeping an eye on new ways to be innovative with digital in the sector – and with ownership levels of VR headwear accelerating; perhaps the more diverse use of this particular innovation is not as far away for charities as we might think. Anna is the commutations, marketing and engagement officer at Royal Trinity Hospice and a trainee on the Charityworks graduate programme. Anna has experience of diverse communications across digital, media and print at the hospice, and a particular interest in the production of engaging content to power social change.